Oxfordshire County Council’s fire and rescue service has a new Chief Fire Officer. Simon Furlong, the service’s former Deputy Chief Fire Officer, is the new Chief Fire Officer, succeeding former Chief Dave Etheridge OBE, who retired at the end of March. As well as being Chief Fire Officer for the county, Simon has also been appointed Oxfordshire County Council’s Director of Community Safety, which includes road safety, business continuity, gypsy and traveller services, emergency planning and trading standards. 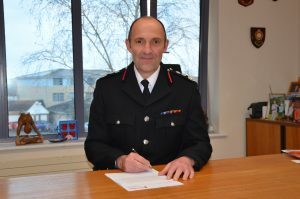 Simon Furlong first joined Oxfordshire County Council’s fire and rescue service in 2012 as the Assistant Chief Fire Officer before being promoted to Deputy Chief Fire Officer in 2016. Prior to this he served in West Sussex Fire and Rescue Service, after joining in 1990 as a whole-time firefighter and progressed through the ranks to Area Manager and has spent almost 27 years in the fire and rescue service. Oxfordshire’s Chief Fire Officer Simon Furlong said, “I am extremely proud to be taking on the role of Director of Community Safety and Chief Fire Officer for Oxfordshire County Council. I believe that we are in a strong position to face the challenges ahead and to deliver real benefits to all our communities by working together with my colleagues in the county council. “We have highly professional fire and rescue and community safety services here in Oxfordshire and I feel very honoured to be given the opportunity to lead such dedicated staff. Everyone who delivers our services, from firefighters to emergency planning officers to support staff, play an integral part in delivering our vision of ‘working together every day to save and improve the lives of the people across Oxfordshire’ and remain fully committed to doing so. “I know, with the commitment and innovation demonstrated by our staff and by working closely with our partners, that we will be able to deliver even better outcomes for the local communities of Oxfordshire. “The fire and rescue service being part of the county council provides a unique opportunity to evolve and improve how we deliver solutions that positively respond to the challenges of providing efficient and effective services that are tailored to the expectations of our communities.